JL Properties and Stanton Street want to help you find the perfect living space in Fairbanks, Alaska. Stanton Street is home to some of your favorite websites and we’re adding Fairbanks Residential Apartment Properties brought to you by JL Properties to our list. Stanton Street has renovated all of the Fairbanks’ web pages to give you updated feel when searching for your new home. Stanton Street has organized six communities on one webpage to help you browse through locations quickly. You are able to see a quick overview of all properties and can go directly to the community site of your choosing. Fairbanks is comprised of six beautiful communities located in Fairbanks, Alaska. You will be sure to find a location that suits your needs. Jillian Square, Northward Building, Parkwest Apartments, Sophie Plaza, Willow Woods Apartments, and Yak Estates new web pages are as bright and beautiful as the communities themselves. You are able to view maps of the property you are interested in so you can get a full overview of the property. Our Community Map tab allows you to see the distance between each Fairbanks Property. The navigation is designed to let you browse the communities with ease. You are able to find maps and floors plans right from the homepage. You are able to view the floorplans on large color images that you can view from any desktop or mobile device. You can also search the rates and forms from the homepage. Each site displays their uniqueness yet has the same familiarity as the other. 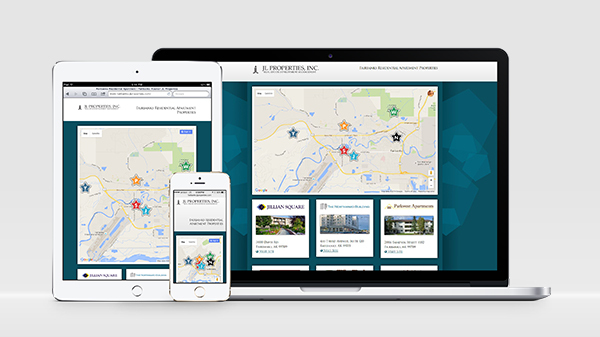 Identifying the amenities that are important to you is easy to find on all six sites. We have made them a part of the main navigation so you can understand how the community will benefit you and your family. Locating and understanding what each community has to offer is quick and easy. You are able to search though loads of helpful information via the Community Information tab. Community information also looks great on any desktop or mobile device. There is a Contact Us tab conveniently located in the navigation of all sites as well as on the bottom of every homepage. Stanton Street and JL Properties wanted ensure your experience browsing their sites was seamless whether you were searching from a desktop or mobile device. Renovate your life in Alaska and trust JL Properties with all your living needs. If you are interested in revamping your website or just need some advice give Stanton Street a call at 915.351.8440.